Ornamental grasses have long been a staple in landscape design, offering a contemporary edge to flower beds, acting as natural privacy screens, and adding visual interest, especially this time of year. And they’re fairly hardy, which means than we can enjoy a wide variety of grasses year after year, with minimal maintenance requirements. In early to mid-fall the seed heads of many ornamental grass varieties come into flower, creating showy plumes that add texture and or colour to your home’s exterior appearance. So while deciduous trees start to shed their leaves, and the plants that beautified your gardens all summer start to die off, ornamental grasses are just hitting their aesthetic stride. This leaves many homeowners wondering what to do with these grasses come this time of year, when yard clean-up is underway. You want to get the job done but it seems a shame to cut down these beautiful plants in their seasonal prime. Essentially, you can’t go too far wrong here. If you prefer to clean everything up now, yielding a clean palette on which winter can blanket snow, then proceed. What’s more, warm-weather grasses are generally spent by this point and may not be terribly pretty anyway, so prune away. Just be sure to wear long sleeves and gloves to protect against cuts from sharp grass blades. You might even consider protective eyewear, depending on how deep into the grass you need to get to adequately trim it back. The last thing you want is the sensation of paper cuts on your eye balls! As previously mentioned, the tall grasses, fronds, and seed heads add visual interest to what can otherwise be a flat, white landscape during the winter. The sturdier stems provide a place for winter birds to perch while seed heads offer them some nourishment. 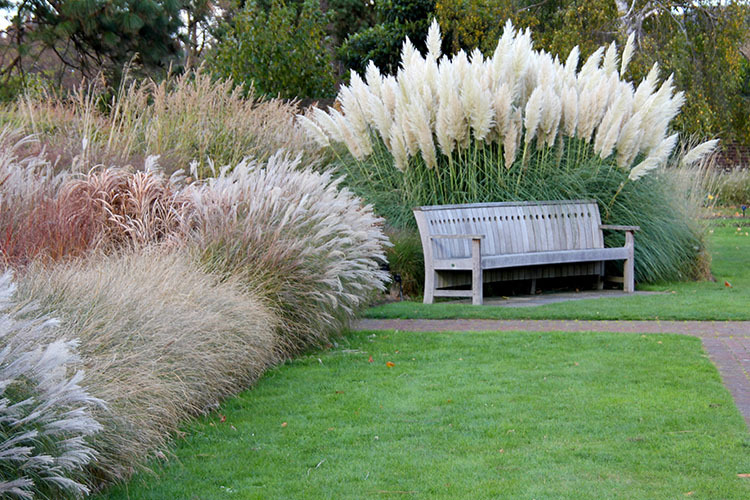 If you use your ornamental grasses as a natural privacy screen, they can continue to do their job through the winter. Whether you prune now or wait until the spring, there are a few things you can do to make clean up as simple as possible without damaging new growth. Again, wear protective clothing (long sleeves and gloves) and protective eyewear. Gather up and secure all blades on a plant. You can either use a few blades of grass from the plant itself or something like garden twine to secure the foliage, which makes cutting a breeze and allows you to haul away everything away in one neat trip. Use clean, sharp garden shears appropriate to the size of plant you’ll be trimming. Tools that are too small for the job demand extra time and effort to get the job done, while tools too big for the job might be unnecessarily unwieldy. If cutting in the fall or before new growth begins in the spring, you can trim the plant back to the ground or within a few inches. If new growth has begun, trim the foliage back to just above the new growth, which will quickly overtake the dead stalks obscuring them from view. Although the initial cutting might create a bit of a choppy appearance for what remains, be sure to smooth out the remaining mound by giving it another little trim. Finally, to ensure a healthy start for the new growth, clear away any loose or matted dead material between the mound’s shoots. In the spring, we’ll create a post that will provide some guidance about selecting and planting ornamental grasses, in case you’re interested in getting started with them or want to add more to your existing stock. In the meantime, enjoy your existing grasses, as many are at their best right now.